On Saturday, April 4, large numbers of Irish people and overseas visitors are expected to connect with the ancient traditions of pilgrimage and retrace their ancestral heritage on the Easter Weekend as they take to this country’s ancient pilgrim paths to celebrate Ireland’s second National Pilgrim Paths Day. 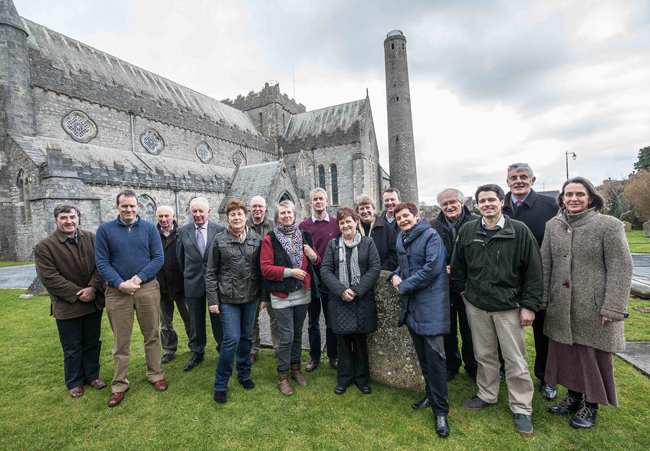 Pictured below are representatives of the Pilgrim Paths groups at the launch of the 2015 event at St. Canice’s Cathedral, Kilkenny City. On Pilgrim Paths Day, events will take place on 11 of Ireland’s 13 Medieval Pilgrim Paths with full details on www.pilgrimpath.ie. These paths are Glen Colm Cille in Co Donegal’s, Slí Mor in Co Offaly, Tochar Phadraig in Co Mayo, St Kevin’s Way in Co Wicklow, St Bridget Pilgrim Path in Kildare, Kilcommon National Pilgrim Loop in Co Tipperary, Rath/Dysert Pilgrim Path in Co. Clare, Cosán na Naomh and Cnoc na dTobar in Co. Kerry, St Finbarr’s Pilgrim Path in Co. Cork and St Declan’s Way in Co’s. Tipperary and Waterford. Heritage guides from local communities will lead each event while outlining the story of the route and explaining how medieval penitents coped with their arduous journeys. There will also be time set aside for thanksgiving and reflection on each walk. National Pilgrim Paths Day is supported by the Heritage Council. For full details of all pilgrim walk nationwide visit; www.pilgrimpath.ie.